I have a bunch of colored images from this month's Daily Marker 30 Day Coloring Challenge, so I put some to use for this sweet card based on the current challenge from the Paper Craft Crew. The beehive and bee images are from the Meant to Bee set from My Favorite Things. I colored them up with Copic markers and cut them out with the matching dies, then used foam tape to adhere them to a light blue pierced square panel. 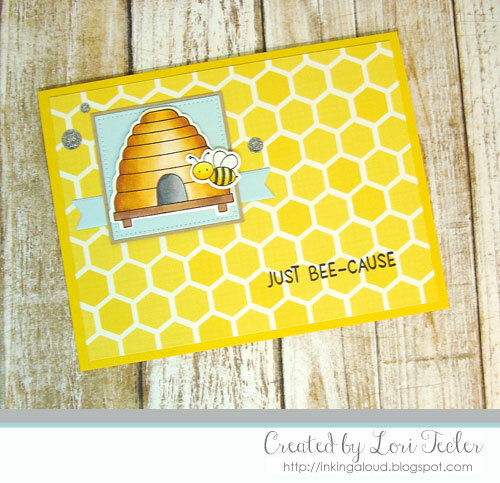 After matting the panel on kraft cardstock, I adhered it to a honeycomb-like patterned paper panel. A blue fishtail flag strip tucked underneath the image panel sets it off just a bit from the background. I surrounded the panel with a trio of silver glitter enamel dots. 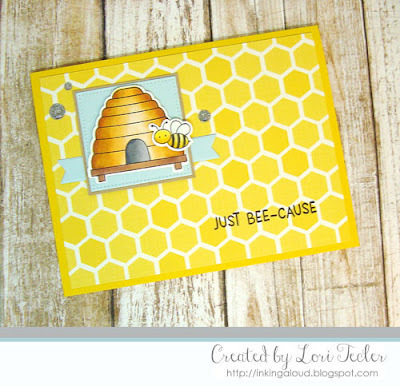 The set's "just bee-cause" sentiment was stamped at the bottom of the patterned panel in Versafine Clair Nocturne ink, my favorite ink to use when stamping a sentiment on a patterned background. The finished panel was adhered to a coordinating lemon yellow card base. I love the bright cheery card after this dark dreary week! Thank you for joining the Paper Craft Crew this week.